My boys love playing with play dough and other sensory doughs. So when I was given the chance to review the new 150+ Screen-Free Activities for Kids book by the oh-so-talented Asia of Fun at Home With Kids, I was super excited to see a sensory dough called "Easy Dough" that looked fun and, best of all, easy. Plus, we had never tried anything like it before! I was especially intrigued by her variations on the easy dough, in particular, the lavender scented one. However, it was the middle of the day on a cold, snow-filled day, so I needed to brighten things up. I decided to make citrus scented easy dough based on her scented variation of the easy dough recipe. This post contains affiliate links for your convenience. 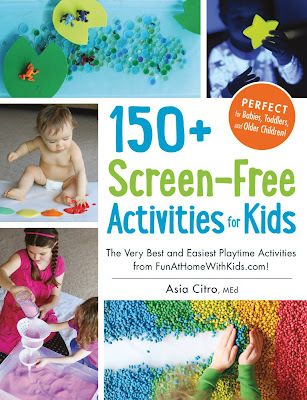 I was also sent a copy of the book 150+ Screen-Free Activities for Kids by the publisher in exchange for a honest review. All opinions are my own. But first, I'm going to tell you why you want the book 150+ Screen-Free Activities for Kids. The gorgeous photographs. Just like I expect to find on her blog, the book is filled with beautiful, color photos of each activity. The organization of the book. Every activity has a checklist of the materials you need, the target age, the time it takes to prepare, and step-by-step instructions. I mean, how easy is that?! The allergy coding. We don't have allergies in our household, but I do know lots of friends who have to be careful with nuts, dairy, and gluten. So having that clearly defined allergy section for each activity is a definite plus. The variety of activities. There is something for everyone in this book. And there is something for every age: babies, toddlers, preschoolers, and school age. So from sensory play to homemade toys (love the puppet theatre!) to homemade art supplies, this book has it all! The variations section was by far my favorite. I absolutely loved how the activities had a section for different ways to modify the activity. For example, the easy dough that we tried from the book, had five different variations to try! You certainly cannot be bored with this book in your arsenal! So to sum it up: I love this book! Since the variations sections were one of my favorite parts about the book's layout, I am here to show you how we took one of her variations and, yup, did a variation on it. Ha! We tried the easy dough recipe. If you already own the book (or when you do! ), then you can find the full recipe on page 50. Just like the name suggests, easy dough is ridiculously easy to make. I made three colors and scents: pink grapefruit, mandarin orange, and lemon. I followed her recipe for lavender easy dough, but I just substituted grapefruit, orange, and lemon essential oils instead. The smelly absolutely yummy! And just as I had anticipated, the boys couldn't wait to dig in and play with it! J was like, "I'll take this one please!" Both boys picked up a ball of easy dough and gave it a whiff. Mmmm...if only it was a scratch and sniff screen, eh? J was more into playing with the easy dough than K, so J happily mixed all three colors together. As Asia noted in her book, the easy dough is a bit crumbly, but that didn't seem to bother J. The messier the better! And look how pretty it is when you mix all of those colors together! And of course when baking soda is involved, one must make it fizz! So I decided to give this baking soda and vinegar tip (also from Fun at Home with Kids) a try! Asia is totally right. It does make the best bubbly reaction ever.